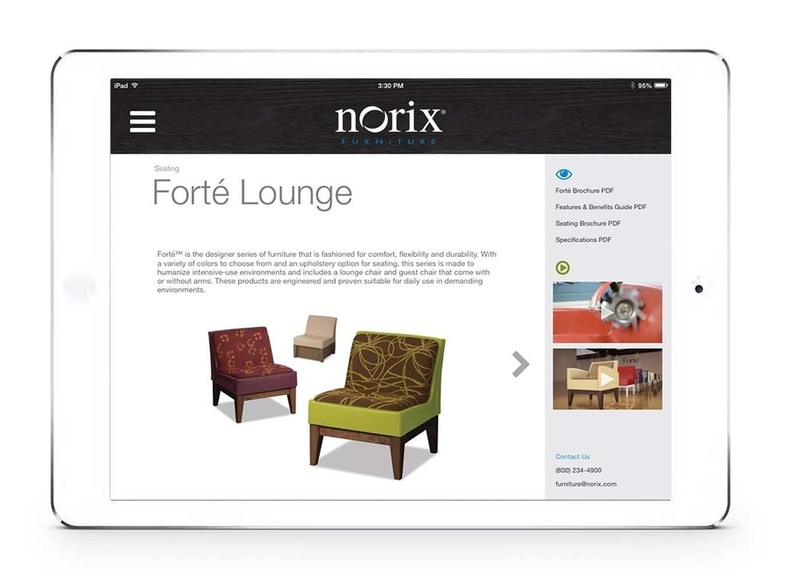 Over the course of nearly two years, I lead & consulted on a myriad of projects via 9INE for Norix Furniture. A full case study can be found below. Highlights of my work with this fantastic company include, the creation of an enterprise-wide brand positioning, the installation of human-centric thinking and tools, the facilitation of numerous workshops and ideations, the transformation of the digital experience and the launch of an innovative R&D group. Norix Furniture opened its doors more than 30 years ago as a small business that primarily manufactured products for the corrections and justice industries. The company originally operated out of the garage of the owners’ house, but with good fortune the company expanded, added employees and began to see real success within a couple decades. Fast forward to the 2000s and Norix found itself wanting to expand even more and made the wise choice to enter new markets – particularly healthcare, shelters, military and higher education – as a way to generate new avenues of income and grow the company. Success was quick and Norix found itself manufacturing furniture that was different in many ways than their early products. These new products came in the colors of nature, were aesthetically pleasing, but still were engineered with the durability that remains the bedrock of the company’s DNA. But by 2013 the company realized that while they had made strides in their product offerings, the company culture had not kept up with the change. Norix hired me to assess the company’s culture and to make suggestions on how it could offer employees the opportunity to think and operate in more innovative ways. Every company is a living, breathing entity. The people, the products, the processes and the physical space included. In order to innovate, you have to go through the process of identifying the core challenges that a company is facing. If you don’t do that first, innovation is impossible. Discovery – This included pouring over documents, researching the company, speaking in-depth with employees, conducting surveys with employees and customers, while exploring other fact-finding excercises. Action – Taking what he learned from the Discovery Phase, I conducted workshops, ideation sessions and innovation projects as a way to determine how the company would move forward and what actions to take to implement change. Execution – The final phase process included the actual implementation of new ideas, processes, products and workflows that were created or enhanced during the first two phases. After the Discovery and Action phases, I discovered one of the biggest challenges that Norix faced was the fact that the company didn’t know why it existed. They understood their customers, products and markets fairly well. And they were certainly experts in what they did, but they didn’t know why they were doing what they were doing. Expansion is difficult and oftentimes impossible if a brand doesn’t understand why they exist and what it is they can offer to the world. Additionally, I found that while Norix had loyal customers who had done business with them in the past, expansion into other markets made it imperative that the company changed the way it engaged with its customers. There are great companies that no longer exist because they don't connect with people. Since Norix wanted to make a hard charge into health care and other markets, it was important that they took a hard look at the way they engaged with potential customers. Lastly, I found that even though the products that Norix were developing were fairly innovative, Norix needed to up their game. Plus the innovation they were doing wasn't trickling down through customer service, marketing, the sales team, engineering and other departments. With this knowledge at hand, I moved forward with multiple initiatives, including the following five that have made the biggest impact. > Consulted on strategic direction for the executive team. > Created a new sales kit and storytelling approach for the sales reps.
> Consulted on marketing department weekly meetings and contributed regular ideas and perspectives regarding all digital and print outreach efforts. > Guided and helped redesign the Norix website with user experience philosophy and approach that made the content more consumable and navigable. > Help design and produce video storytelling projects with branded storytelling approach, showing the value and thought-leadership that Norix provides. > Fielded a customer and internal research study to gain greater insight into customer perceptions and created a qualitative and quantitative study on customer and internal perceptions. > Created and facilitated cultural opportunities like the company-wide Innovation Competition to practice and flex innovation muscles. > Consulted on strategic product portfolio plans across all markets. > Created dozens of new product, service and business model ideas for execution. Ideas include market insights, functional and emotional product benefits, execution details, potential names and initial sketches. 1. Created a brand positioning statement that was adopted by the executive team and all departments to guide strategic business, marketing and product development direction and assist those throughout company in understanding the Norix mission and company goals. 2. Instilled human-centric thinking, research and methodologies into product and service development that focused on the end-user, which helped Norix create more useful products. He was also responsible for the installation of customer experience tools which created more engaging experiences around Norix products and services with the aim of creating greater retention of repeat customers for the long term. 3. Facilitated five ideation and training workshops which achieved a 90 percent participation rate throughout all departments in the company. Many employees had never worked together or knew each other beforehand. The tools and processes that came out of these sessions have been adopted by most departments. 4. Consulted on and implemented a product development process that ensures projects successfully move through the organization. This included innovation work moving seamlessly into product development and the creation of “recon” teams from all departments which were tasked with ideation efforts for new products, the creation of process checks to mitigate product development rework and post project assessment. 5. Launched a Research and Development group aimed at fueling innovative ideas, introducing new tools and new ways of thinking. This included the oversight of innovation resources and methodologies throughout the company and the encouragement of nimble, outside thinking in product and service development. Also created and maintained a new Innovation Lab where ideation and product development sessions and recon team meetings took place.